Driving or walking all the way to the shop, spending hours to purchase a thing or two and then waiting in the long queue to pay for it.. Going through different websites, purchasing products with a click and then paying online and waiting for the product to be delivered..
E-commerce makes it convenient for customers to shop at home and hence, it is trending. Due to its popularity, almost all businesses have gone online. But to list the businesses that made it big in the field of e-commerce, there may be very few of them; the reason? Most of them forgot a major element to their success- DIGITAL MARKETING! You create an e-commerce website and then you wait for customers to flock in and shop things from your site just like a physical shop! This dream of yours could have come true only if your website is the only E-commerce website existing online. But, unfortunately, it is not. Marketing through online ads and various other methods may attract some web traffic. But, even that very small number of users may not stay in your website for long if they don’t find it easy to use. Greater the user experience, more will be the number of visitors to your website and for that, you need to have enough functionalities. Confused, are you? Well, don’t be. Improving the functionalities of your website is also definitely a part of digital marketing. That is the power of social media. Social media platforms are where you can find your customers belonging to the younger generation. 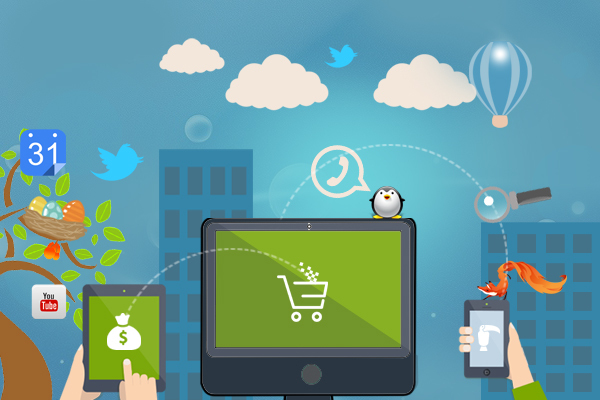 Through proper marketing techniques, you can easily spread the word about your e-commerce venture in social media and win customers, causing your business to flourish. Therefore, social media marketing is always a great choice for brand building and word of mouth publicity. Yes, it is true because you are not famous! Not everybody online knows you or your business. For people, to reach a website, it all starts from the search engine and it is common for them to click only those websites in the first page of the search results and just because you own a website doesn’t mean that you are there in the first page. That’s where Search Engine Optimization (SEO) and PPC (pay per click) come to our aid. Success can’t come to you in a day and being a newcomer in the e-commerce field, you may be very well aware of it. It is not at all a loss if you really spend a very small amount of your money in the process. Yes! We are talking about affiliate marketing here, where an affiliate places your ad on their website and when a customer clicks the ad and converts the sale, it is tracked. The affiliate then gets a commission while you get a sale! When it comes to business online or offline, customer is the king. If you happen to satisfy your customer’s need, you win. Digital marketing gives you the opportunity to connect directly to your potential customers. This in turn helps you in knowing what the customers think about your business and what they expect from you. Thus you can improve your online business and reach greater heights. Creating an online presence for your e-commerce business isn’t that easy as you think, especially when you don’t know the ABCs of digital marketing. You can’t act “I-know-it-all” when it comes to business and you will have to depend on a team of experienced people well versed with digital marketing such as JointViews. We keep track of the latest trends in digital marketing and hence our approach is always result oriented to make your presence felt online. Our team of content writers, SEOs, animators, graphic designers and word press developers make it possible through our efforts. If you are still doubtful of what we are capable of or if you think you need our service, feel free to Contact Us.